Riding in DC's protected bike lane on 15th Street. Well, Washington DC isn't working the way it's supposed to. But one thing in the District definitely has been: its local bike transportation policy. 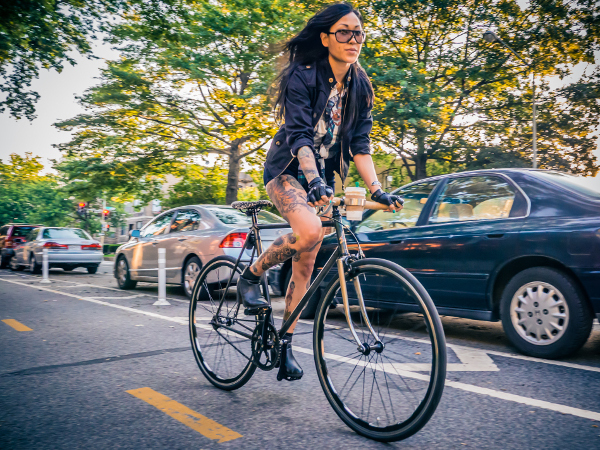 Census data released last month validated an idea that's been bubbling through the bike world for a couple years now: of all the major U.S. cities reinvesting in human transportation, none has been making bikes work better for its people more rapidly than the nation's capital. Source: Census Bureau, via League of American Bicyclists. Last year, the new estimates found, DC jumped past San Francisco and Seattle to become the nation's No. 3 city for bike commuting. Since 2007, the District has added about 9,000 net new regular bike commuters, almost as many as there are in all of Minneapolis, the No. 2 city. And all this despite having only a "Silver" rating from the League of American Biyclists' widely respected rating of cities' bike-friendliness. DC is the only major U.S. city that has sold more than 3 percent of its population on bike commuting without at least a "Gold" rating from the League. It's enough to make you wonder if the rules for making a city great for biking are changing — and if Washington is rewriting them. "A lot of cities are really changing the game with bike share and big investments in new off- and on-street networks," bicycle author Elly Blue said in an interview last month. "DC is an example of a city that's done all three and is winning big. In 2009, I thought it was the worst city I'd ever biked in (that was before I went to Vegas), and now it's really fun and relaxing." Washington Area Bicyclist Association spokeswoman Alex Baca has a similar story. Large-scale public bike sharing, brought to DC in 2010, "normalized" biking by making it cheap and easy for people to try, and the growth of physically separated bikeways made biking more comfortable once they did. "I think the most significant thing to point to is Capital Bikeshare," Baca said Tuesday. "Our infrastructure needs to improve, but people love the 15th Street cycle track. The L Street cycle track has its problems, but people like it. We hear from people that say that's their reason for biking on that street." Kathy Card, the general manager of two office buildings in DC's fast-changing Chinatown, said last week that she doesn't ride a bike herself. But watching traffic at the bikeshare station at 8th and H, she said, has convinced her that some of H Street's four auto travel lanes and two parking lanes should be repurposed for protected bike lanes. Dedicated bike infrastructure is what's needed, Card said, to help her buildings appeal to the private-sector firms she's marketing to. "There's plenty of ability to put bike lanes in," Card said last week. "Obviously the demand is there." 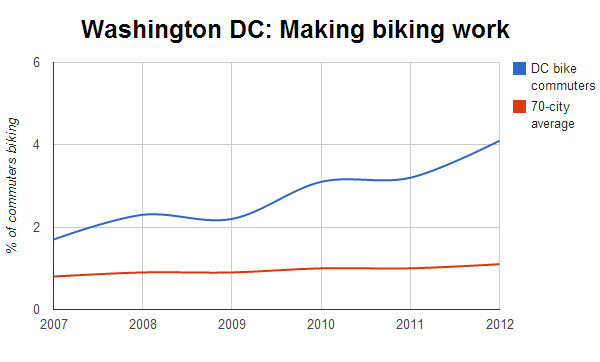 In Washington, thanks to six years of creative investments in better biking, it is now.